Aigoo means "Good Grief" in Korean. This blog's been around since August 2002, and it belongs to TC who blogs about her life as well as her hobbies. It’s September, and it’s a wonderful four-day weekend for me! I’m feeling a lot happier than I was in my last post. Amazing how something simple as a four-day weekend can do to one’s mood. Anyway, it’s time for another round of Timeless Thoughts, a monthly blog link-up run by Georgie and me. This month’s entry is hosted by me, so if you would like to participate, you’re more than welcome to join our link-up by submitting your entry with the link-up widget located at the end of this entry! This link-up is opened for two weeks, and your entry can be about anything you find unforgettable from your past or present! It can be an object, an event, a person — anything goes — and you can have more than one thing you miss. For this month, here’s what I’ve been missing lately! Ah, Lisa Frank. I remember being completely enthralled by those products. The rainbow colours, the cute characters, the stationery supplies — all of them appealed to me back when I was into such super colourful and cutesy designs. I’d wanted everything Lisa Frank and I’d begged my dad to order them through the catalogue. I cannot remember what I had ordered all now, but there were two things I’ve kept all these years because I hadn’t want to throw them away — my sticker and eraser collections. 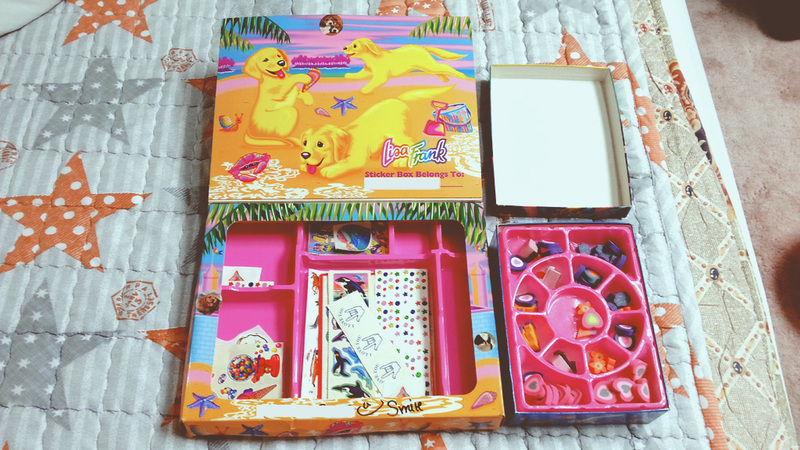 I’d kept the boxes and their original contents, and I’d even added a few other non-Lisa Frank stickers and erasers over the years. These boxes were my babies, and I’d cherished them for about twenty years. A few weeks ago, though, while I went through my things, I asked myself, “Why am I keeping these?” Sure, I kept them for nostalgic purposes because I wanted something from my childhood, but what was I going to do with them? I was just letting them sit and collect dust. I don’t use the erasers, nor do I do anything with the stickers. My brief contemplation led me to realise that I don’t need to hoard these any longer and I can pass on one of my beloved childhood keepsakes to a little kid who’d love and appreciate them like I had. My friends and I had shared Lisa Frank with each other, and now it’s time to share it with the new generation of little girls (and boys, if they want!) who’ll appreciate the vibrant designs. I gave my collections to one of my favourite kids from my previous workplace. Her mum and I’ve also grown to be good friends, and when I brought up the idea of giving her kid my collections, she said, “‘Libby’ will love them! Lisa Frank missed out on the one kid who’d have funded her entire retirement!” We both laughed, and I knew then I’d found the perfect child to take over my cherished collections. When her mum gave them to her for me, Libby disappeared into her room for two hours. Hearing that made my smile since that indicated to me perfectly that the collections had enthralled her. I am content with my decisions. I’ll miss them, but it was time to part with them. 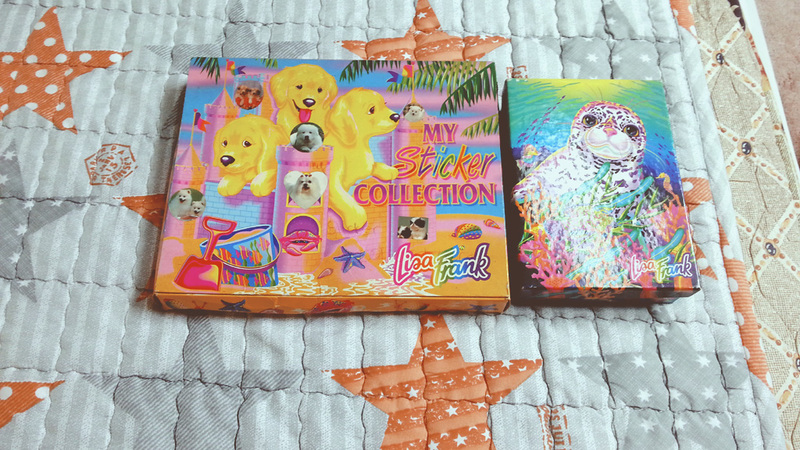 Did you like Lisa Frank products? What are some things you’ve kept from your childhood? Share with me in the comments! This concludes my post. Below are the rules, banner, and the widget for you to submit your entry; you will have two weeks to submit! I look forward to seeing all your posts, and I hope to see you all again next month at Georgie’s blog! Link back to this info page: https://aigoo.me/timeless-thoughts with a text or a banner link. If you aren’t able to participate during X month, it’s okay! Feel free to join when you can! I don’t think we had these producs when I were a child in my country. They look amazing. I am pretty sure every child would love these. This is an interesting idea you and Georgie came up with. I was actually thinking about organizing my blog a little and start doing some blog series. I am a really bad writer and I think this would help me to improve my English and also improve my writing a little bit. I hope you’ll participate in Timeless Thoughts one day! :D I don’t think you’re a bad writer, by the way! You write fine! I remember Lisa Frank!!! I only had a few colouring books though, from what I remember… or just some notebooks. Hell, I loved her colourful designs. It was so sweet of you to give your cherished Lisa Frank stickers and erasers to someone who would really value them! That’s how I feel about stuff I own but no longer want. I really like the thought of giving them to someone who will really appreciate them. :) Stickers though, stickers are amazing… I often used to collect them and not do anything with them because they were too cute, gah! I am trying to remember if I even had the colouring books or notebooks XD I can’t remember. It’s sweet of you to give your collection to a kid at your previous workplace. Hope she’ll love it for a looooong time :). The only thing I remember having right now from my childhood are my Hello Kitty sandals from when I was 3… For some reason, I remembered trying to wear the HK sandals and it really hurt my feet- but they are so cute! Aw, man, you must have missed the heyday of Lisa Frank! I’ve not heard of Lisa Frank before but they look super cute and as a stationary lover, I understand why you kept it for so long :P I’m glad that you got to let it go though and give it to someone who would use it. I find that I always keep things “just in case I need to use it” when in actual fact, I know I won’t use it ever again. This mindset has changed over the past year and I think I’m addicted to being minimal and not hoard things as much. LISA FRANK!!! I’m pretty sure I still have some stickers around here somewhere! Didn’t she turn out to be kind of a terrible person in the end? I think I remember reading that somewhere. Thanks for the blast from the past! Yay, I’m glad you’re feeling happier! When I was young, I loved Lisa Frank. I wanted to collect everything from her. Looking back, I still really like the bright and cute style, haha. There’s now a Lisa Frank adult coloring book, and even though I’m not a fan of them, I kind of want that one. That was really nice of you to give your sticker and eraser collection away to a kid from your previous workplace! That’s great that she seems to love it. I think it’s a good idea to pass things down, so younger generations can enjoy the same things :) It can be hard to do, but it feels good to know that someone will use them. YES. I wanted to collect everything of hers, too! They were so enchanting! If you get the colouring book and colour, do share them! Lisa Frank was THE BOMB! <3 I had a few stationary items including an assignment notebook filled with LF stickers. <3 Brings me back to my elementary school days! When I hit middle school, the obsession switched to Paul Frank…But they're totally not related. Comments are no longer accepted on this post. However, feel free to contact me if you have any questions or comments regarding this post.